The strong educational foundation that they are given in Children’s House carries through the elementary program, ultimately shaping a child who is inquisitive, respectful, and worldly-wise. Practical Life activities help the child to develop independence, competence, and confidence through use of materials that speak to the young child’s love of doing and participating. This curriculum area offers a wide variety of everyday materials for the child to use to develop order, coordination, concentration, and independence – all of which lay a strong foundation for later academic achievement. Activities include many of the tasks children see as part of the daily routine in their homes such as sweeping, scrubbing, sewing, and food preparation. Through these tasks children develop skills to care for themselves, for others, and for their environment. The Sensorial curriculum speaks to the young child’s innate desire to directly and actively explore the world through one’s senses. These materials help to refine the child’s sensory awareness and foster his/her ability to make judgments and comparisons on the basis of size, shape, weight, texture, and sound. The child is invited to explore the world through activities involving touch, sight, smell, sound, and taste, and in so doing develops cognitive skills by learning to order and classify sensory impressions. Dr. Montessori agreed with Aristotle, who stated that “there is nothing in the intellect that was not first in the senses”. Social and emotional development involves the development of life skills including learning to manage one’s emotions and impulses, positively engaging others in developing relationships, and learning to participate in the community in a purposeful and productive manner. The young child begins to recognize emotions and begins to learn the lifelong skill of managing his or her feelings and expressing them appropriately. Through everyday experiences in a supportive, multiaged community the child develops sympathy, empathy, and appreciation for human differences. Children learn the skills of negotiation and conflict resolution through daily interactions with others and through learning to work through disagreements at the “peace table”. Movement is central to the Montessori curriculum and educational environment. The development of fine and gross motor coordination, balance, body/space awareness, and strength are incorporated into every aspect of the child’s learning experience. In the Practical Life Area, the child’s small and large muscles are challenged daily through their use of everyday living activities, caring for themselves, and for their environment. In the Sensorial Area, the child refines large and small motor movements and balance during set-up, execution, and putting away activities. Visual motor planning is specifically targeted in this Area. The Language Area specifically addresses gaining the proper grasp for using writing instruments and developing handwriting skills. Movement is also central to the use of the concrete materials in the Mathematics and Cultural Studies Areas. The Outdoor Environment and Physical Education Program provide extended opportunities to build endurance, flexibility, balance, and coordination of movement. Montessori Children’s House classrooms are language rich environments. From the earliest age children learn to use language to express their needs and feelings, developing oral and receptive language skills as powerful communication tools. Children’s vocabularies are enhanced on a routine basis through specific lessons and through the practice of using accurate and correct language when naming things. Words like “sphere”, “peninsula”, and “rectangle” are examples of specific language that children learn to use in relation to experiences with concrete objects. The Language curriculum follows the child through sequential activities that develop skills in sound discrimination, prepare the hand for writing, encourage the development of written expression, and lay a foundation of phonetic skills that prepare a child for reading and writing. Children develop visual and auditory discrimination skills through matching, sequencing and rhyming activities, playing “I Spy” games to develop awareness of the sounds that make up words. The child is introduced to sandpaper letters to aid in the mastery of sound/symbol association, eventually composing simple phonetic words and learning to read (decode) both phonetic and sight words. This process unfolds in a predictable sequence, but as the child is ready, not on a set teacher-directed time table. The refinement of the pincer grip through various Practical Life activities supports the eventual use of a pencil for handwriting. During the Kindergarten year the child continues to practice with phonetic and phonemic skills, putting them into daily practice with actual reading and writing activities. The refinement of the hand continues as the child practices handwriting skills on a daily basis. In this year, the children are introduced to the story elements of character, setting, plot, conflict and resolution as well as the genres of folk tales, fables, fairytales, fantasy, non-fiction, and poetry. Dr. Montessori believed mathematics to be a natural and satisfying function of the human mind. Systematic discovery of the relationships among numbers can lead children to become mathematical thinkers and problem solvers. 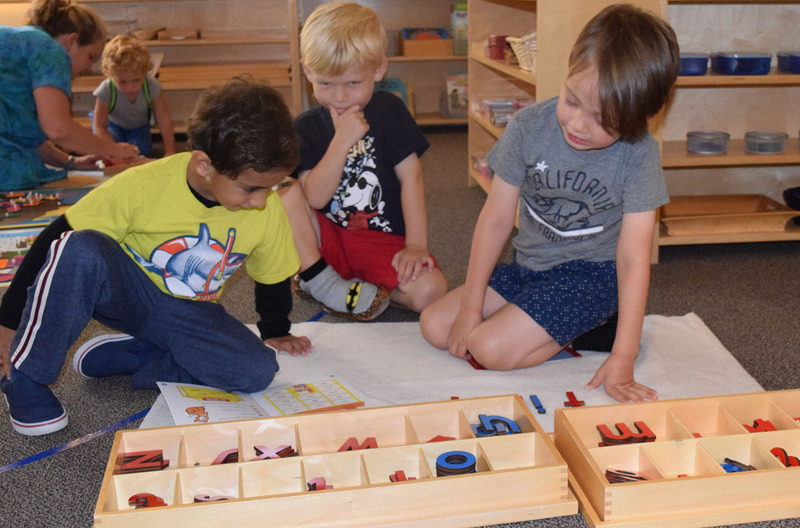 The Montessori Math materials support the child’s gradual understanding of abstract mathematical concepts through the manipulation of concrete materials. Over the 3-year Children’s House cycle the child internalizes concepts of number, symbol, and sequence, exploring the decimal system through use of concrete materials, and working with operations such as addition and subtraction, again through use of concrete, attractive, and engaging materials. The Montessori Math materials help the child build a solid foundation of the basic math principles to prepare for later abstract reasoning and to develop problem-solving capabilities. As a first year child using the Montessori math materials, the child is immersed in the concept of numeration/ identifying the numerals one to ten, counting using one-to-one correspondence, and associating symbol and quantity. These skills and concepts form the foundation for all later mathematical experiences. Building from this foundation, the child moves on to recognizing the symbols and quantities of the numbers one to one hundred. The child is also introduced to the concrete quantities and symbols of the decimal system in a sensorial way. As a Kindergartner, the child works extensively with the decimal system materials, using them to perform operations; s/he extends knowledge of linear counting, using the bead chains to count to 1000 and to begin skip counting. The Kindergarten child edges further toward true abstraction, beginning to memorize math facts and gaining extensive knowledge of the patterns related to the operation tables. Using hands on materials, the Kindergartners are introduced to the concepts of number relations and algebra, geometry, measurement, money, and telling time. The Children’s House History and Geography curriculum builds upon the child’s keen interest in our planet and the life upon it. Beginning with the creation of the Earth, during a child’s birthday celebration, the child gains an impression of the passage of time; this concept will be explored much more fully in the Lower and Upper Elementary classrooms. Children’s House classes focus each year on continent studies, helping children to gain an appreciation of different cultures, holidays and traditions celebrated around the world.